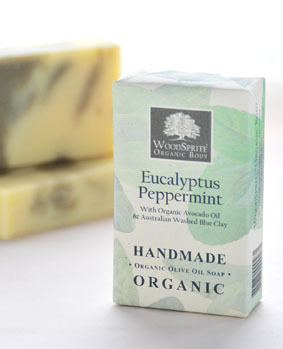 A real breath of fresh air, Organic Eucalyptus and Peppermint helps to open the airways and increase circulation. With the added benefits of Australian Washed Blue Clay to deeply cleanse and revitalize, this lively soap will bring a smile to your face and a tingle to your skin! Absolutely No Artificial Colors, Fragrances or Preservatives. Not Tested on Animals. Ingredients: Saponified Oils of *Extra Virgin Olive, *Coconut, *Palm & Sunflower; Pure Essential Oils of *Eucalyptus & *Peppermint; *Avocado Oil, Australian Washed Blue Clay, French Green Clay. Normal to Combination Skin. (*Certified Organic) 100% Natural. 4 oz. in 100% Post-Consumer Recycled Paper Wrapping. I love, love, love this soap! Not only is the scent uplifting and refreshing, but the lather is creamy and leaves my skin so soft and smooth. Thank you and please keep making this soap! So refreshing, and lathers like crazy.